Thanks to Red Pegasus Decals we have a nice series of decals suitable for civilian aircraft. This is possible because they use ALPS printed decals. These can be printed on demand and offer quality that is equal to or better than many standard silk screened decals. 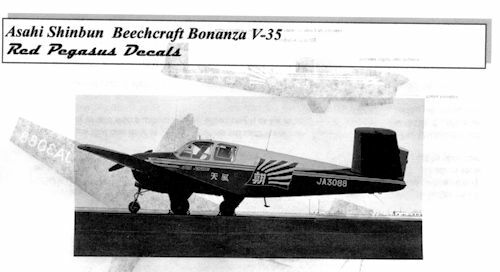 Most of us are familiar with the rather unique V tailed Beechcraft V-35 Bonanza. This plane was produced as such from 1947 to 1982 with the standard tail version continuing in production until 1995. The Asahai Shimbun operated three of these aircraft during the 1950s and 1960s. It was pretty standard for this newspaper to operate its own aircraft having done so before the Pacific War. This decal sheet is for 'Amakaze'; JA3088. For the kit, Entex makes a Bonanza in 1/48 scale. It has been reboxed by a considerable number of other companies and so is not difficult to find. It is not exactly the same airframe as this aircraft, but one can make a decent replica with it. The aircraft is in white uppers with most of the rest of the aircraft in reds for a very colorful aircraft. The instruction sheet tells you of all that needs to be modified. I should mention that I have darkened the sheet image so you can see the white bits. This is a very distinctive set of markings and is a great way to do something a bit different. You can get yours from http://redpegasusdecals.com . Thanks to Red Pegasus Decals for the review sheet.